Word has it there’s a bloke in Broome looking for camera operators for the upcoming races. Word also has it he works closely with a journo from the ABC. Right, I can try to kill two birds with the one stone, get some paid work and possibly work alongside the journo whom may be on the interview panel for a job I’ve applied for at ABC Broome. But this means sacrificing a camp in Kakadu with Andy and Michelle at a spot that one can only get in if booked years in advance. Spewing. After umming and arghing for the next 24hours the decision is made to leave Darwin and head to Broome. 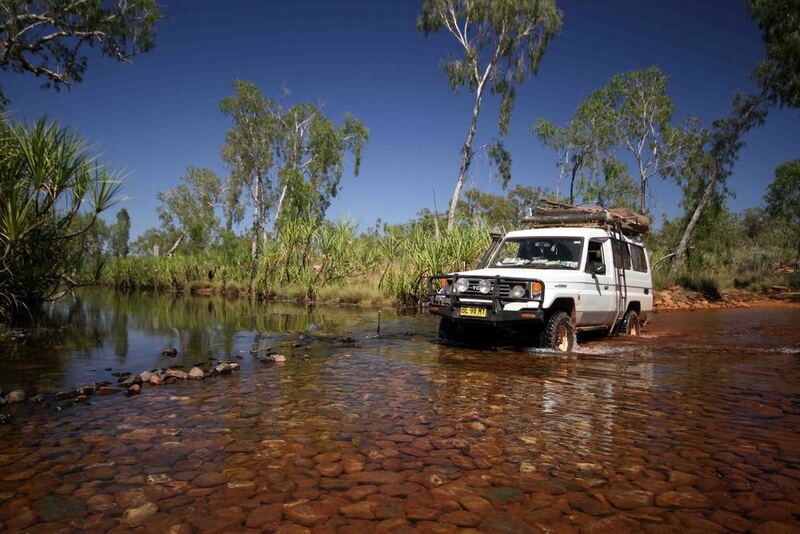 We’ve three days to cross the Kimberley deciding to take the bitumen instead of the Gibb. Stocked up, fuelled up, new radiator we turn west onto the Victoria Hwy and the traffic disappears. The horizon rolls out into the shimmering distance dragging the road out to an infinite, unreachable point. The Troopy willingly pushes along, bringing our life with it. 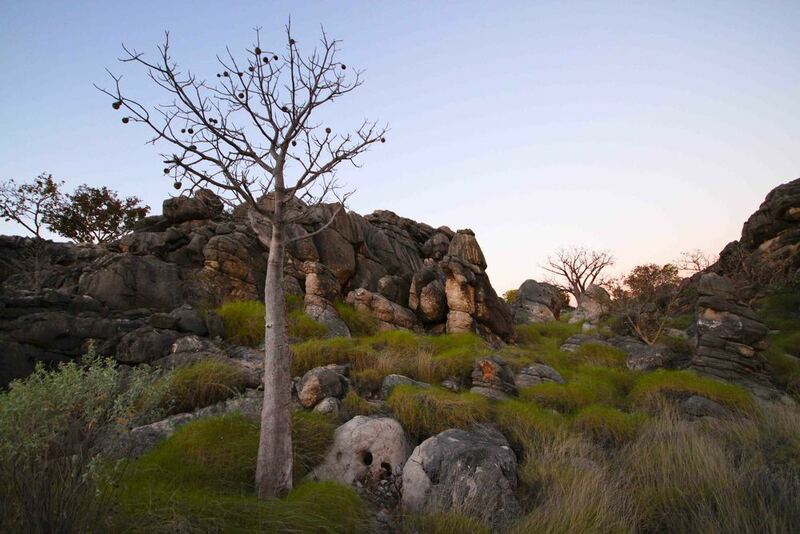 We unwillingly drive past the Bungle Bungle turnoff, and continue along what is at first a scenic and colourful drive. Brilliant red dirt covered in wildflowers and trippy looking spinifex framed by large looming escarpments on both sides of the road. This soon turns to flat, degraded cattle country, a perfect time to get lost in J.R Tolkien’s world of the Lord Of The Rings. Gandalf leads us through this treacherous desert, with goblins and orcs close on our tail. 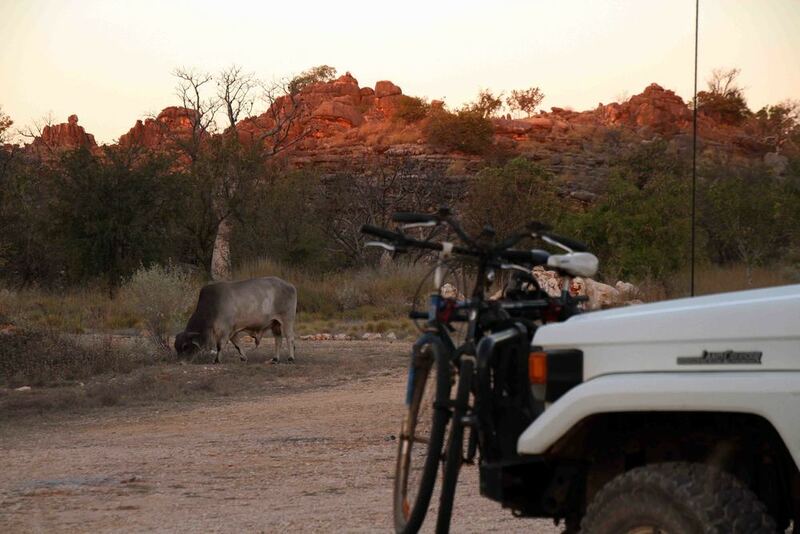 We stop in at Geikie gorge then camp at the Boab Quarry. Boab’s and bulls everywhere. Big night sky and an amazing, alien landscape to awake to. Pressing on early we stop in at Fitzroy for afternoon tea. A little aboriginal kid kicking a ball around the empty car park throwing constant sideward glances at us. Finally his ball rolls over and for the next half our we happily kick the ball to each other, his brother joins him and timidly venture over, peering into the back of our car staring at a mess that even the biggest hoarder would be overwhelmed by. The brothers don’t seem to interested in talking, just watching, so I pull out some paper and pencils and they instinctively set to work drawing. Mum comes over and collects the little fellas, we say bye and they bounce off, picking up boab nuts along the way. We push on for the last few hours to Broome. Fortunately our good friends and fellow Treehouse ambassadors Tom and Madz, live and work in Broome and have a spare room. After such along time we are so stoked to see their familiar faces, share big hugs and a bottle of vino on the dunes of Cable beach and watching the sun set (a ritual I could easily get used to). I work two days at the races with Paul from Feral Films and meet the journo from ABC. There’s a half-foot of swell running at cable and we paddle and surf our muscles back into shape. After 3 months out of the ocean even the smallest of waves can be satisfying. The next evening Tom’s rallied some troops, with boats together to watch Jimmy in the Tinny, Jimmy Barnes that is. 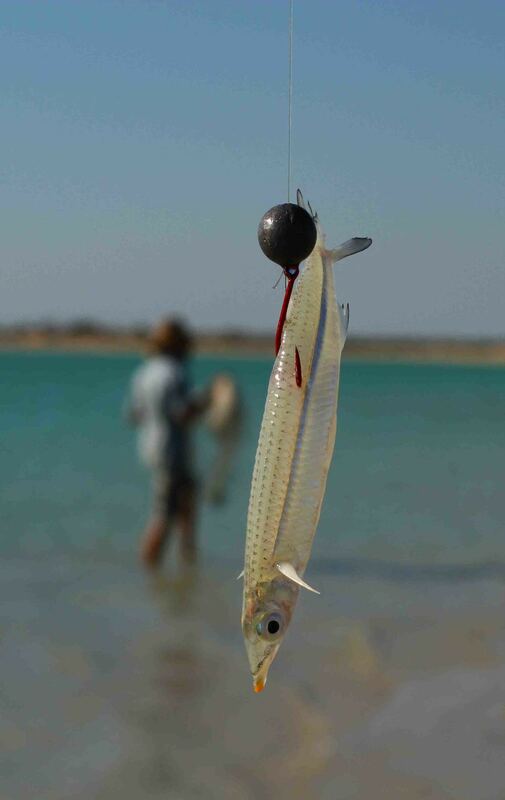 Launching a small fleet of tinnies from Broome we putt out towards the moon raising itself from dusky waters of Roebuck bay and drop our lines. An endless cloud of fruit bats rolls on from the mangroves to the horizon. One big threadfin salmon was hooked whilst a rod was pulled over board, spirits where high and jimmy roused us all into a crescendo chorus of working class man. Right at this point, Madz managed to hoick a big-toothed barracouta into our slowly sinking tinnie. A moment I will never forget. Satisfied we return to shore, Tom backs the trailer down onto the wet mudflats, connecting the flooded boat to the winch, he attempts to heave the boat up onto the trailer with several of us struggling to lift the heavy beast, the boat refuses to budge and the winch decides enough’s enough and snaps from its rusty weld. Eventually we drain the tinny and lift the boat onto the trailer whipping it out of the grasp of the rising tide. 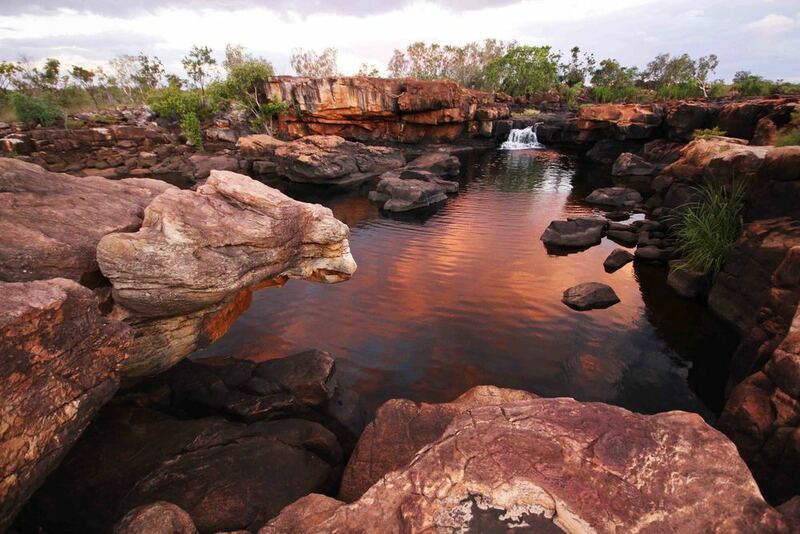 With a typical Broome Friday night secured under our belt we make a move to explore the depths of the Kimberley. We’ve got 10 days to make it to Mitchell falls and back. 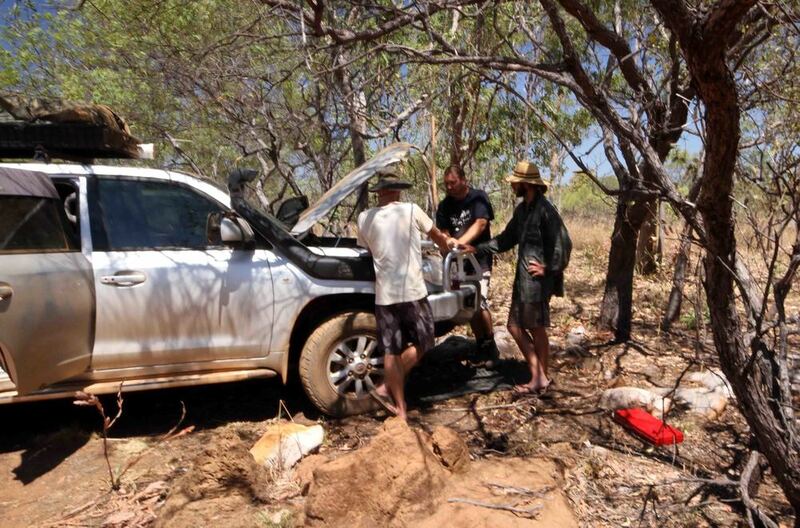 With about 1800kms of heavily corrugated roads ahead of us we quickly grab a second spare tyre from the wreckers, and give the car a quick service before we head up the Gibb River Road. Newer PostA festival on wheels?